Racing, fashion, Top Hats and Pimms, Royal Ascot vibes were certainly felt at the boutique racetrack on Sunday for Naas Racecourse's Royal Ascot Trials Day & Ladies Day featuring the Goffs Lacken Stakes. 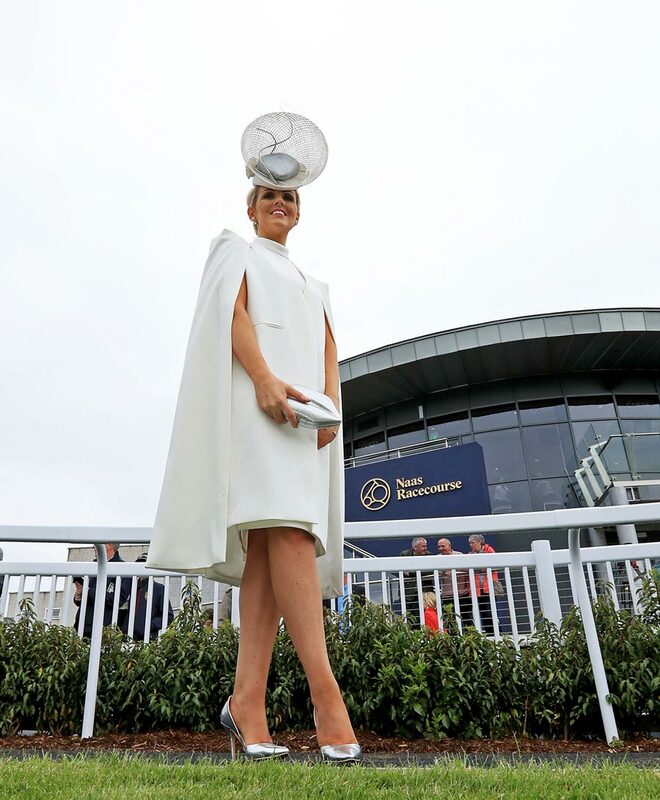 Keeping in mind the fashion theme of the day, ‘A touch of Royal Ascot’, stunning County Down woman Charlene Byers was announced as the Best Dressed Lady. Charlene wowed the judges with a stunning white cape from Lavish Alice and a beautiful hat from milliner Laura Hanlon. It was certainly a prize worth winning and one that was much sought after by the large number of Ladies who entered the Best Dressed Lady competition, as Catriona and 19 of her friends or family will be treated to a lavish night away and dinner in the historic Palmerstown Manor. Catriona will be given the opportunity to add some fabulous outfits to her wardrobe after also winning a €1,000 spend at Kildare Village. The feature race on the day was the Goffs Lacken Stakes which was won by the Aidan O’Brien trained Sioux Nation and ridden by Ryan Moore. Following on from today's racing, Sioux Nation, Brother Bear, winner of the Owenstown Stud Stakes, Sergei Prokofiev, winner of the Coolmore War Command Rochestown Stakes and Coolmore Stud Irish EBF Fillies Sprint Stakes winner Servalan and runner up Chicas Amigas will all be aimed at Royal Ascot races in June. Celebrity fashion Judge on the day was TV3 presenter Anna Daly. Anna was joined by Klara Heron, acting editor of Irish Country Magazine and Anna Fortune, Commercial Manager of the Kildare Post on the judging panel. Fashion Judge Anna Daly said: “I had a fabulous day here at Naas Racecourse for their Royal Ascot Trials & Ladies Day. The style stakes were really high and it was fantastic to see a collective mix of styles from high end to high street to costume made. It was interesting to see the level the entrepreneurial spirit here on the day, Ladies are not just attending to enjoy themselves but also to promote their small to medium businesses. The relatively new Circle Building really has brought the track to a whole new level. Overall, it was a fantastic day and well done to all the Ladies who entered and, of course, the lovely winner Charlene.” The next race meeting at Naas Racecourse will take place on the 18th June and their BBQ Summer Evenings will kick off with Hermitage Green performing on the 27th June. For more information about Naas Racecourse or to buy tickets online visit naasracecourse.com. For more information contact Sales and Marketing Manager Jackie Donohoe, [email protected].